1795 Flowing Hair Silver Dollar. BB-14, B-4. Rarity-3. Two Leaves. VF Details--Cleaned (PCGS). 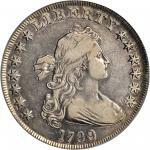 1795 Flowing Hair Silver Dollar. BB-20, B-2. Rarity-3. Two Leaves. Fine-12 (PCGS). 1795 Flowing Hair Silver Dollar. BB-27, B-5. Rarity-1. Three Leaves. VF-35 (PCGS). 1796 Draped Bust Silver Dollar. BB-61, B-4. Rarity-3. Small Date, Large Letters. Fine-15 (PCGS). 1797 Draped Bust Silver Dollar. BB-71, B-3. Rarity-2. Stars 10x6, Large Letters. VF-35 (NGC). 1799/8 Draped Bust Silver Dollar. BB-142, B-1. Rarity-4. 13-Star Reverse. AU Details--Whizzed (NGC). 1799 Draped Bust Silver Dollar. BB-165, B-8b. Rarity-3. AU-50 (NGC). 1799 Draped Bust Silver Dollar. BB-165, B-8a. Rarity-3. VF Details--Cleaned (PCGS). 1799 Draped Bust Silver Dollar. BB-166, B-9. Rarity-1. EF-45 (NGC). 1799 Draped Bust Silver Dollar. BB-166, B-9. Rarity-1. VF-25 (PCGS). 1800 Draped Bust Silver Dollar. BB-184, B-12. Rarity-3. VG-10 (PCGS). 1800 Draped Bust Silver Dollar. BB-193, B-13. Rarity-4. AU-53 (PCGS). 1802 Draped Bust Silver Dollar. BB-241, B-6. Rarity-1. Narrow Date. AU Details--Cleaned (PCGS). 1802 Draped Bust Silver Dollar. BB-241, B-6. Rarity-1. Narrow Date. AU Details--Tooled (PCGS). 1841 Liberty Seated Silver Dollar. OC-4. Rarity-1. MS-63 (NGC). 1845 Liberty Seated Silver Dollar. OC-1. Rarity-2. Unc Details--Questionable Color (PCGS).